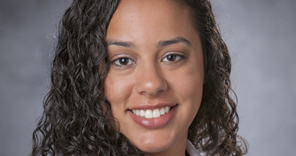 Duke Family Medicine second-year resident Alexa Mieses, M.D., MPH, was elected to be the Resident Representative to the AAFP Board of Directors for 2017-18. Elections were held last month at the 2017 AAFP National Conference of Family Medicine Residents and Medical Students in Kansas City, MO. Throughout her medical school and residency career, Dr. Mieses has truly been an advocate for the profession of family medicine. Look for a highlight of Dr. Mieses in the November edition of the North Carolina Family Physician magazine. Congratulations!